In this third of three part series, I’ve called color grading “the unseen VFX” because it's a visual sleight of hand that, in most cases, should not be apparent to the audience. But to digital content creators who understand its impact on setting mood, atmosphere and continuity, grading, or timing as it is sometimes called, is so important to the overall presentation, that it literally influences every frame of a production. There are many options and solutions when it comes to color grading. Each hardware or software solution comes with a wide variety of features covering most of the desired ancillary tasks, such as tracking, wire removal and, in some cases, even product placement. They all do color grading, but not always in the same way. Both interfaces and technology can be different. Red Giant, and its primary color correction tool Magic Bullet Suite 13 for Mac or Windows, has become a leader in both TV and motion picture production, providing plug-ins mainly for Adobe Premiere Pro and Apple Final Cut Pro X. Red Giant believes that artists should be given professional tools that are intuitive to use. For example, Magic Bullet Looks comes with hundreds of pre-sets, each of which mimics something you would find in the real world. One may look like the matte box of a camera, and if you drag your image onto that icon you will see a picture of a camera to which you can add a filter. Other enhancement options will immediately be made available to customize that pre-set for whatever color need you may be seeking. 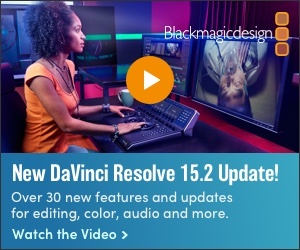 In their Colorista IV software, a standalone color grading plugin for Adobe Premiere Pro and After Effects, Red Giant provides a guided color correction process that helps the operator quickly attain overall color correction on any given shot based on the experience of top professional color grading experts. Red Giant also provides a set of transition tools in their Universe package, and just last month, the company released Universe 2.2 that not only added 11 new transitions, for a total of 76, but made all of them available to Avid Media Composers. SCRATCH version 8.6, from Assimilate, also running on Mac or Windows, works with any resolution in any format and now comes with advanced HDR and ACES (Academy Color Encoding System) workflows. Because SCRATCH supports most professional media formats from RAW to traditional intermediates such as DPX, EXR, QuickTime, etc. to compressed like XAVC and other H264 variants, it is often first used on dailies by ingesting the SDI signal from a camera directly. This lets the DIT (Digital Imaging Technician) add the DP’s LUT to evaluate the desired image parameters in the video village and actually begin the color grading process on set. While SCRATCH has its own online editor, it can also import a timeline from most offline NLEs such as Final Cut, Media Composer or Premiere Pro and lets the user navigate through a multilayer timeline down to any composite element within the shots. Speed has always been a hallmark of SCRATCH, even enabling one to quickly apply primary and secondary grading by utilizing qualifiers, curves, vectors, unlimited grading layers and masks in any free form shape. You can even nest and cache nodes to preserve real-time playback in case you are working with complex composites. Effectively, this provides an intermediate render on a given shot to maintain real time playback. When used to create digital intermediates, SCRATCH is known for its interactivity which is a byproduct of its speed. In a client participant session, it is often important to be able to interactively show results on the screen as they are created. With a software as computationally powerful as SCRATCH, this even extends to lens flares. To better understand the color correction production process we asked Warner Bros. Post Production Creative Services how they manage the creative workflow. As a full service post facility, Warner Bros. Post specializes on film and OTT projects, and offers a wide variety of services from green screen to final play out. About 60% of their projects are for the Warner Bros Studios themselves, but they are open to other customers, too. Because they deal with few actual sprocket-driven film releases these days, all of their DI suites are based on the DCI-P3 color space used for digital movie projection. TV projects are, of course, guided by Rec 709. Warner Bros. Post depends on the hardware-based Baselight 5.0 color correction system from FilmLight for features and Blackmagic Design’s DaVinci Resolve for television shows. Warner Bros Studios is one of the few color-grading facilities that can offer complete production services. They were one of the first to offer 4K services back in 2011, and now are sitting on top of 5 petabytes of storage to deal with all the footage they have to wrangle. Probably the biggest benefit of bringing a project onto the Warner’s lot is the staffs’ experience in working with content. The company’s infrastructure has seen just about every kind of production, so it can handle almost every challenge. And, because staff is highly experienced with archival projects, they do a lot work in image restoration. Can you believe “Harry Potter” films are already going through a restorative process? We began this excursion into color grading by considering the effect it has on audiences and the creative process. But in fact, a huge percentage of color grading tasks have more to do with fulfilling international technical and format requirements than satisfying viewers. The Marquise Technologies’ ICE Reference player supports any type of file from SD to 4K, including DCP as well as Interoperable Master Format (IMF) packages without prior ingestion. Dedicated to post houses, broadcasters, archives and cinema operators, Marquise Technologies’ ICE plays natively all the formats used in the industry in the production, post production and distribution phases, and also support ACES and HDR content. The Swiss-based company has products that support a mind-bogglingly number of deliverable formats, as often required by international distribution. The software converts already graded content, in what is called a “trim pass”, and conforms it to other distribution formats. Disney Studios, for example, uses Marquise Technologies’ MIST software to up to 36,000 different deliverable versions of a major film. True, this may have to do with issues affecting censorship and political correctness as well as fitting a square color space into a round color format, but they all come under the same mastering concept. For sophisticated color correction, Marquise offers a real-time RAIN grading software that provides direct feedback on color decisions without the need for any rendering. RAIN uses an ASC CDL grading mode and a standard ACES workflow. It also features a Grade Library that stores unlimited color looks for any current project, and lets the operator easily access previous projects’ stored grades. It even has a Storyboard mode to create up to 32 groups of clips to color correct them as an ensemble. Marquise also offers the TORNADO, an automated transcoding server supporting not only all broadcast formats but also DCP (Digital Cinema Package) and IMF (Interoperable Master Format). This extends the idea of grading past the artistic level to the technical level. But for the audience, it all comes under the same file heading of the unseen VFX. You may enjoy reading the previous two articles in this three-part color-grading tutorial.